But there were three things that changed my mind. So that's it - I have been powered by nature since then! Once on board with Mike Golding, two Olympians and "Animal" it ranged from "Eternal Father strong to save" to "Hold on Tight to your dream..."!!! Things got quite hairy out there... I'm not entirely sure of what was going on but I know this: One boat crashed.Our boat sails started making a noise and our boys had a bit of a rumpus about this and the twirly thing (I think)There was some waving of flags and shouting.The boat tipped from this side to that and our job was to crawl from one side to the other and try not to get in the way!Tacking was less violent than jibing...and lastly it was FAB! A mixture of speed, salt, beer, freedom and friends. A very good day! PS: Thank you to Ben from J P Morgan who gave the three of us a lift to the fish and chip shop in Southampton too!!! PPS: You can pronounce ecover as follows:Eee coverEh co Verrrehco VerrrDoesn't seem to matter! YOU are invited to the launch of the New Wiggly Shop at Labels Outlet Shopping! 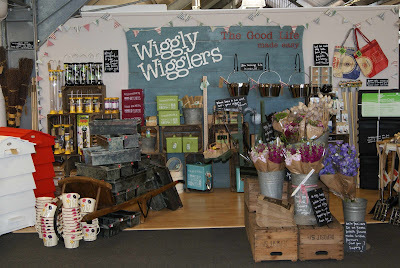 Please join us for the launch of the new Wiggly Shop on Thursday 12th August at Labels Outlet Shopping. You'll find us on the upper floor at Labels right by the food hall. Come along anytime between 9.45am and 8pm and find out how to make a wormery, how to hand-tie a beautiful posy of flowers and how to stay green as you clean!Plus there'll be a draw to win an amazing worm cafe out latest generation wormery, worth £99! Free Goodie Bags and DemosEvery hour, on the hour, we'll be holding we'll be holding quick 10 munute Wiggly Talks, answering your questions and giving away lots of FREE Wiggly Goodie Bags! Labels has everything for you and your home. With a Coffee Shop, Seafood Bar, Food Hall with Deli and Master Butcher, and now, of course, a great new Wiggly Shop. See you there! Talks will last about 10 minutes and there will be time for some questions, plus we’ll be giving away 10 Goodie Bags every hour - what fun! Plus if you print off this invitation and bring it on the day it will entitle you to a lovely cup of Earl Grey Tea (or normal tea, or coffee, as you prefer) AND a slice of chocolate cake (or Victoria Sponge) in Labels' Coffee Shop. How can you resist?